As a cost cutting measure I have forgone my time in the G1000 and been flying the steam gauges as of late. Several of my flights were even without the luxuries of any GPS (oh mercy me). Whether you call it cheap, old school, or more authentic flying does not matter. What matters is I have enjoyed these recent flights without all the bells and whistles and spending more time with my head out the window looking for landmarks (don't worry G1000 I will return to you soon enough). One of the things I have rediscovered is my love-hate relationship with the VFR sectional chart. 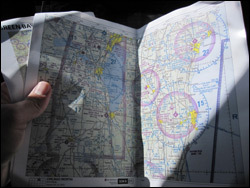 Often when flying in the G1000 enabled Cessna my sectional chart plays a supporting role which finds it left folded in my flight bag. Recently however, I have been pulling out and referencing the sectional chart on a more regular basis. I forgot how much I enjoy the sectional. Preflight, I can spend hours looking at sectionals and dreaming of all the cool places to fly, choosing routes and spots to fly over, plus I like the smell of sectionals even more than a magic marker. On the other hand inflight, I feel like I need to have trained under an origami ninja to fold the charts into a useful shape that allows me to fly safely without being distracted by this cloud of a five foot by four foot map covering my windshield. How often have you asked your co pilot to take the plane while you wrestle with an uncooperative sectional? Happens to me too often. I guess I was not the only pilot frustrated with sectionals, enter Eric Boles and SkySectionals. SkySectionals are downloadable, print on demand sectionals (also available for TACs & Enroute charts) broken into letter-sized panels meant to a more manageable chart solution. Eric was kind enough to share with me a sample of his product for a recent flight in Northern Wisconsin. I liked being able to make notes on the printouts without worrying about using a pencil, erasable highlighter or destroying a sectional. It was convenient to download on demand and print prior to flight. I have at times intended to buy a sectional at the airport only to have them be out of stock. The flight I was on was a short cross country but due to the location of the airports in relationship to breaks on the page required me to flip between four different panels which was unwieldy causing it to be as inefficient if not more inefficient than pulling out my chart. All in all I think it is a creative solution and for the uber-organized it is probable a gift from above. I think for my needs I will likely stick with the standard sectional, something about the smell of them I just can't live without. My first Certified Flight Instructor had just completed her own training at the Delta Connection Academy when we started flying together. In retrospect I really benefited from her advanced training. One of the first things she taught me was how to provide a thorough preflight briefing. The practice of giving a briefing before every flight is one I have practiced ever since. During the Chicago Air & Water Show I had the honor to fly with the U.S. Navy Blue Angels in their C-130 known as Fat Albert. Major Brendan Burks gave the most impressive preflight briefing I have ever experienced before our flight, setting the bar high for all my future preflight briefings (see video below). Prior to the flight he addressed the crew and explained in detail the current conditions, planned maneuvers and how the crew would address any emergency should it arise. It was clear to everyone involved what to expect during the flight and who would be responsible for various aspects of the flight, mission accomplished. We don't all have the privilege to fly a four-fanned C-130 supporting the Blue Angels, but we can strive to bring that level of forethought, professionalism and preparedness to each of our flights. Whether you are flying with other pilots, passengers or flying solo I think it is extremely valuable to verbally walk through aspects of your upcoming flight including emergency procedures. I am fairly particular about who I choose to fly with and one immediate turn-off is when another pilot neglects to provide a preflight briefing. On the flip side, I am immediately put at ease when I share a cockpit with someone who takes time to conduct a proper briefing like Major Burks of the Blue Angels or as was the case with Rod Rakic of myTransponder last summer. I think the video below will inspire you to work on your preflight briefing routine before your next flight. Looking for some additional tips? 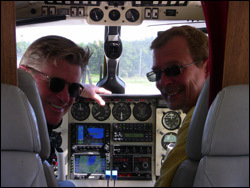 Check out Paul's post on Ask a Flight Instructor for some sample scripts. 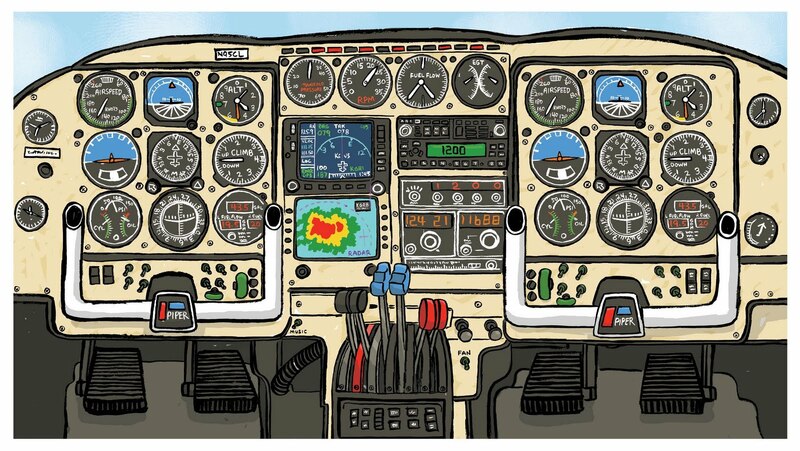 Also, Jason Miller of FinerPoints published a podcast several years back that gives some tips on giving an effective preflight briefing. He may not be "The Most Interesting Man in the World", but he's up there. 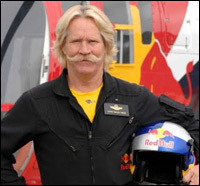 Handlebar mustache wearing, daredevil pilot Chuck Aaron is the only pilot licensed by the FAA to perform aerobatics in a helicopter. Until four-years ago helicopters had traditionally played minor roles in airshow, unable to perform the awe-inspiring aerobatic feats of their fixed wing counterparts. That changed when aviation enthusiast and Red Bull founder, Dietrich Mateschitz, convinced Chuck Aaron to find a way to perform aerobatics in a helicopter. After a few years of tinkering to extremely modify a BO-105 Bölkow Helicopter a one-of-a-kind aircraft emerged. The Red Bull Helicopter is able to perform the Roll, Split-S, Immelman, Half Cuban Eight, Back Flips and Chuck's very own Chuckcilvak. The helicopter can support great forces including 3.1 Gs and negative 1.0 Gs. Aaron is making his second appearance at the Chicago Air & Water Show this weekend. Last year he mesmerized the crowd with his aerobatics. Although, everyone along the lakeshore will be fixing their attention on him during his performance he won't even notice they are there. 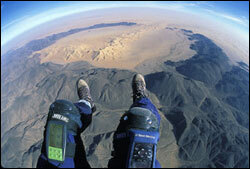 Aaron explains "I go into severe focus mode, paying attention to altitude, air speed, where the sky and ground are. I don't pay attention to the crowd-that's a deal breaker". I had the opportunity to take flight with him prior to the show (video below). It was wild that on my first flight in a helicopter, I got inverted. Aaron put the Bull Cow through a series of Rolls, Loops and a Split-S, putting 2.4 Gs on the craft in the process. Oddly enough the maneuvers did not feel much different then they do in a fixed wing aircraft. The fact that it wasn't a plane but a helicopter makes this man one of the most interesting in the world. Stay inverted my friends. Each year the Mayor's office tries to offer something new or special at the Annual Chicago Air & Water Show. In addition to the standard excitement the airshow brings there are a few new additions that have me excited. First off Chicagoans will get a chance to be one of the first airshow audiences to see Sean D. Tucker's newest airplane the Challenger III biplane. 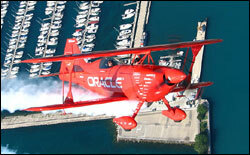 Sean began performing in this new airplane in late-June and this will be just the fifth airshow in this new airplane. According to Sean the plane is "30% better" (sounds like a laundry detergent commercial) and as a result he can perform maneuvers beyond what his previous Challenger II was capable of. Airshow fans can expect to see new maneuvers including somersaults and multiple cartwheels. Sean has always pleased the fans at the Chicago Air & Water Show, this new aircraft will ensure many will walk away saying his act was their favorite. Interested in learning more about the Challenger III biplane? Take a listen to Brian Norris, Operations coordinator for Team Oracle, discuss all the new features on the AVWeb Podcast. 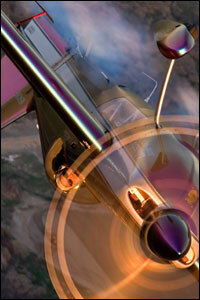 New this year will be an appearance by Bill Stein in his Zivko Edge 540. Stein was a member of the famous Red Baron Stearman Squadron that used to be a regular act at the Chicago Air & Water Show. Bill's plane which has been referred to as his "Tumble Machine" will be sure to earn some cheers from the crowd as he shares his extreme aerobatic maneuvers. Something unique about his performance is that his aircraft uses cutting edge paint technology that allows the plane to continuously change colors based on varying angles between his aircraft and the spectators. We also have learned that Actor & Pilot Treat Williams will be attending the 52nd Annual Chicago Air & Water Show. To many he may be best known for his leading role in the WB's Everwood. Pilots know that he is a passionate aviator who is a multiengine instrument rated commercial pilot with rotorcraft, CFI and Citation type ratings. PilotMag ran a feature story about Treat in their May/June issue. According to the Mayor's office, Williams will be a special guest for Friday's practice show in which he will guest announce the first part of the show with Air Show Announcer Herb Hunter. 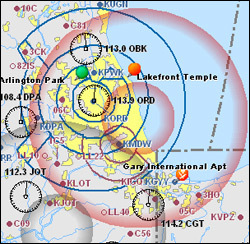 Stay tuned to MyFlightBlog.com for ongoing updates on the Chicago Air & Water Show. Please be sure to check out our Ultimate Guide to the Chicago Air & Water Show including our Chicago Air & Water Show Viewing Guide highlighting the best places to watch the show. 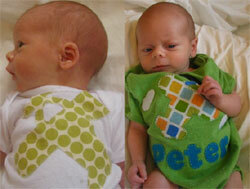 In June my life changed considerably with the birth of my twins, Peter and Sarah. Over the past month, despite sleepless days and nights, these new additions have brought endless amounts of joy to my wife and me. One thing my wife and I have learned thus far about parenting infant twins is that we are lucky if in a given day we can accomplish one non-care based chore or project. As a result, my time to fly, read about flying, blog or twitter has been drastically curtailed as of late. Though with each week that passes and as our parenting confidence and experience grows, I find myself realizing I am getting closer and closer to carving out enough time to get out to Palwaukee to go flying. In the meantime I am enjoying merging my newest joys, Peter and Sarah, with my joy for aviation. I have recently become a big fan of Etsy, a site that connects sellers of custom crafts with buyers globally. I searched Etsy for "Airplane Products" and then filtered by products for "Airplane Products for Children" and have found tons of neat products for my kids and for gifts for friends of ours. Some of my favorite products thus far have been Airplane Onesie in Green - $12.99 (as seen on Sarah in the photo above - left), Personalized Airplane Onesie - $17.99 (as seen on Peter in the photo above - right) and M'liss Lil Airplanes Burpy - $4.95. Speaking of aviation products and gifts for kids I have to say it is interesting to note that in three instances we have been blessed to be given gifts from friends or family where the gift for my son featured an airplane and for my daughter featured a flower or some other "more girly" design. I guess that is why sites like "Girls with wings" as a resource to let girls know they to can be pilots. Luckily Sarah has a father that will be sure to share aviation with her equally as I do with Peter. A few months ago AOPA's Flight Training Magazine went through a redesign. In the June Issue Deputy Editor Ian J. Twombly shared some letters from readers sharing their mixed reviews of the redesign, which reminded me that I had not yet shared my viewpoints on the redesign. My overall thought is the redesign is an upgrade of the previous magazine experience. It continues to be the premier magazine for student pilots interested in learning to fly. That being said there are areas that I hope AOPA continues to tweak to further improve the reading experience. I'll start out with what I love about the new magazine design and experience. The entire "Preflight" section at the beginning of the magazine has been positively improved. The addition of a Sport Illustrated-esque two page photo spread is a beautiful way to kick-off the section. What pilot doesn't enjoy looking at great aviation photography? I would love to see it expanded to include one professional photo each month and one member submitted photo with a brief story describing the photo. I also enjoy the "This Weekend" feature with the nice depiction of events taking place across the country. Though, I would love to see that part of the website updated weekly rather than monthly. The feature articles have also been improved with better imagery and iconography. In the current issue there is an interesting article on Energy Footprints, I appreciate the nice infographics that accompany this article. Since the redesign their seems to be a concerted effort to use more infographics, which as a visual learner I appreciate. I have heard some people complaints that the articles are getting to short, possibly adapting to the increase in attention deficit disorder. Historically, there were articles that felt like they had been lengthened to meet a word count but were not providing addition benefit or detail. I think this is where the infographics play a vital role, as a picture can be worth a thousand words, shaving space but still communicating the core message. As a result I believe Flight Training Magazine has found the right balance for their depth of information. I was also impressed with this month's "Technique: Track your flight" article which shares with readers the ins and outs of creating a GPS track of your flight for post flight review and sharing via the web. This type of content is a perfect example of great content that previously was only found on blogs. 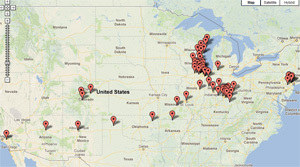 I learned from fellow bloggers how to do this a few years ago and love tracking my flights. 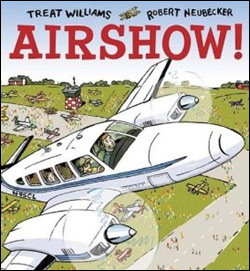 I am glad to see Flight Training bringing some of these great ideas to print. Even more impressive is that on the redesigned Flight Training website their is a video walk-through of the sames process. Although, I like more aspects of the redesign than I dislike, I was disappointed with a few of the changes. I was disappointed with the way some of my favorite elements of the magazine were de-emphasized. I feel like the designer ran out of steam when it came time to design the pages that house the regular commentary from Greg Brown and Rod Machado. Readers feel like they know both of these authors as we follow their advice and adventures month to month. It is disappointing that their sections of the magazine did not receive as much attention. I would love to see work done to bring these parts of the magazine more to life. 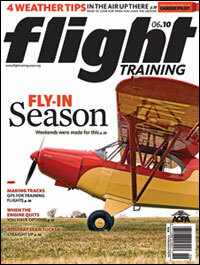 All in all I am happy with the redesign of Flight Training magazine, what were your thoughts on the redesign? George Steinmetz has one of the coolest jobs in the world. Steinmetz is a professional photographer who uses a motorized paraglider to capture unique sights from around the world. One of the greatest benefits of my private pilot's license is the ability to enjoy a unique viewpoint of the world that the few of us that can fly enjoy. Steinmetz takes that privileged to a whole new level flying on of the most primitive flying machines and gets airborne over some of the most remote parts of the world. His reward is our treat, award winning photos that have been featured in National Geographic and Life Magazine. I have always been intrigued by aerial photography. Previously, I have written about Yann Arthus Bertrand and his aerial photography book Earth From the Air. Both Bertrand and Steinmetz are extremely talented photographers however I am drawn to Steinmetz's photos more maybe due to the intimate nature of flying so primitively in such remote destinations. This time last year I had the opportunity to go on Safari in Zambia and Botswana. I was blown away by the stunning landscape and the amazing wildlife. Seeing Steinmetz's photos brought back this wonderful place to the forefront of my memory. He merged my love for Africa and Travel with the excitement and thrill of aviation. The video below will give you a snapshot of some of his amazing photographs. You can buy his book "African Air", view more of his photos, or learn about his motorized paraglider on his website. George Steinmetz - African Air from George Steinmetz on Vimeo.